CINCINNATI -- Jon Saylor and his JS Gold & Coin stores were a household name in Cincinnati at the peak of the gold rush in 2011. Then the price of gold plummeted in 2013 and Saylor, who had achieved the status to throw out the first pitch at a Reds game, disappeared, leaving a trail of unpaid bills for building leases and billboard and television advertising. For years, attorneys and creditors tried unsuccessfully to find Saylor, who continued to live locally, or his business partner, Nancy Hendricks, and were forced to take the unusual step of serving them by placing public notices in a newspaper. Assets were liquidated. Foreclosures and evictions followed. But Saylor never resurfaced. Jon Saylor during a video interview on June 6, 2011. WCPO discovered that Saylor, who still owes tens of thousands in court judgments, has been soliciting customers to sell unwanted jewelry, coins, gold or silver on a private social neighborhood network in recent months. Saylor also has an online company based in Loveland, River City Gold & Coin , which does not have a brick-and-mortar office, according to the website, but buys gold and silver by meeting customers in coffee shops, parks, libraries or their homes. River City Gold & Coin does not have a business license in Ohio. The company, and Saylor, also lack a precious metals license, which is required in order to buy and sell gold in Ohio, according to a spokesman from the Ohio Department of Commerce. "River City Gold & Coin has earned its reputation as the most competitive cash buyer of jewelry, diamonds and coins," according to its website. "Anyone can tell you we are straight shooters and we never make blind offers." River City's website does not list a person's name; no employees or owner is mentioned. It simply lists a phone number. This is the same phone number that Saylor used in his postings to buy gold on a neighborhood social site. When WCPO called the number, Saylor answered, and said he would call back. Attempts to speak to Hendricks were also unsuccessful. Brad Karoleff, owner of Coins Plus in downtown Cincinnati, is a member of the prestigious Professional Numismatists Guild. At one point in 2014, JS Gold & Coin and/or Saylor and Hendricks had more than $440,000 in court judgments against them for unpaid bills. Today more than $86,000 remain in court judgments against Saylor or JS Gold & Coin. Most creditors recouped their money after a judge ordered that a West Court Street Downtown building owned by Hendricks and JS Gold & Coin be sold at sheriff’s auction in 2015, according to court documents. But not everyone got paid. While working on this story, WCPO learned Saylor also once owed the station $63,000. In 2013, the station wrote it off as a loss. Sinclair Media (which operates WKRC here) has a $57,314 court judgment against JS Gold & Coin for unpaid television ads. They sued Hendricks and JS Gold in 2014, but eventually dismissed the claim against Hendricks because they could not find her. This building at 21-23 West Court Street was once owned by JS Gold & Coin, but sold as a foreclosed property at auction in 2015, and the proceeds went to creditors. Steven Rothstein, an attorney for Kanter Investments, is still trying to recoup more than $29,000 from a court judgment against Saylor and JS Gold & Coin for a broken lease agreement on a store in Forest Park. Throughout his adult life, Saylor, 44, has lived under short bursts of intense media attention, followed by long stretches of anonymity. Saylor first stole the spotlight in 1999, when the 26-year-old political newcomer ran for Fairfield City Council. After a seemingly storybook campaign, the handsome and charismatic Saylor beat an older, well-known candidate for the seat. But he didn’t stay on City Council long. Months later, authorities uncovered a voting fraud scheme. Saylor had created sham voters and filled out absentee ballots as votes for himself. He pleaded guilty to 58 counts of voter fraud and was sentenced to two years in prison. Jon Saylor spent two years in prison after pleading guilty in 2000 to voter fraud in his scheme to win a seat on Fairfield City Council. The story captivated the community, who followed the drama surrounding his prosecution and sentencing. Sheriff deputies couldn’t find Saylor for days to serve him with a subpoena. Then Saylor’s father collapsed in the courtroom on the day of his sentencing. After Saylor was released from prison in November 2002, he quietly tried to rebuild his life. In 2005, he graduated from Miami University with a bachelor’s degree in political science with a concentration in geology. He then began working as a numismatist, an expert in coins and currency, and an assayer, someone who studies precious metals, according to his LinkedIn profile. But one local coin dealer was immediately suspicious of Saylor. At first he didn’t realize that it was the same Saylor who went to prison for voter fraud. When he realized the truth, he warned his partner to stay away from him. “He’s a convicted felon who went to prison for fraud,” said Joe Barrett, who owns Main Street Coin in Fairfield. Barrett’s late business partner, Mike Dickmann, was a mentor to Saylor a decade ago and tried to teach him the business. “The sad fact is you can be a ‘coin dealer’ and not know anything about coins and tell people you are an expert and as long you know more than their grandma does about coins, they’ll believe you,” Barrett said. Yet Saylor was starting a business under seemingly ideal circumstances. The value of gold was about to skyrocket. People began raiding their jewelry boxes for unwanted pieces in 2011 as the price of gold climbed its way to record highs. 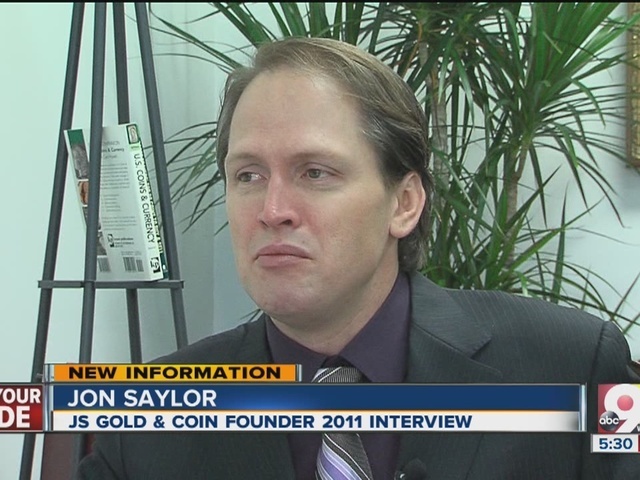 As the nation was sinking into the Great Recession, Saylor opened his first JS Gold & Coin store on July 1, 2008, according to the Better Business Bureau. At the time, gold was selling at $990 per ounce, far below its current value. Saylor incorporated the business on Dec. 23, 2009, and a week later, filed additional documents adding Nancy Hendricks as the new agent of the company. The store at 7322 Kenwood Road would become the headquarters of JS Gold & Coin and its flagship store, where many of his commercials and television interviews were filmed. That store was later sold as a franchise. The shopping plaza on Kenwood Road where Saylor opened his flagship store in 2009. There is no longer a JS Gold & Coin store here. Historically gold has been a safe haven during times of turmoil, and when stocks dive, gold usually moves in the other direction, Karoleff said. “Years ago … if inflation was going up and the fear factor was going up, then gold would go up,” said Karoleff, who noted the recent value of gold seems to be following the market, making it harder to predict. By August 2011, gold reached a new high value of more than $1,900 an ounce. Gold hit an all-time high in September 2011 of nearly $1,900 an ounce. And Saylor was riding that gold boom. He drove a Porsche Cayenne and a Maserati GranTurismo, bought a $428,000 home in a Mariemont subdivision, threw out the first pitch at a Reds game, and created a charitable foundation in his name. JS Gold & Coin spent more than $57,000 from December 2012 to June 2013 – nearly $10,000 a month on television ads. It also regularly spent $10,000 a month on billboard ads in 2013, according to two lawsuits filed in Hamilton County Court of Common Pleas to recoup the money. But the bubble burst in 2013. By the end of the year, gold had taken a 27 percent loss and finished at $1,204 an ounce. Prices slid for the next few years. Lawsuits against JS Gold & Coin began almost immediately. Banks filed for foreclosure on Saylor’s Mariemont house (it was quickly sold) and the JS Gold & Coin building Downtown on West Court Street. A real estate company sued, claiming Saylor stopped making payments on his Kenwood commercial building. In October 2012, the Hamilton County Sheriff Department’s Regional Narcotics Unit seized Saylor’s Porsche Cayenne at a Marathon Gas Station on Kenwood Road near his JS Gold flagship store, as well as $8,947 in cash, as part of a drug investigation. Soon after Saylor filed court documents claiming he was the “innocent owner,” of both the car and the money, and had “no knowledge of illegal activity involving the property.” But a year later, Saylor gave up his right to the property and signed an agreed forfeiture order. He was not charged in the case. As lawsuits mounted, the JS Gold & Coin stores were quietly sold as franchises. Throughout 2013 and early 2014, five separate JS Gold & Coin businesses were incorporated in Ohio, all owned by different people, all completely separate companies from the original JS Gold & Coin. Some still operate under the JS Gold & Coin name, while others have new names. Saylor donated $500 to the Mariemont School Foundation in 2011, one of his first gifts from his new nonprofit, the JS Foundation. Meanwhile creditors scrambled to find assets. “JS Gold & Coin, Inc., by and through its namesake, Jon Saylor, is attempting to avoid its creditors and dispose of assets by selling off the assets of its stores,” attorney Stuart Brinn alleged in his lawsuit. He sued the new JS franchises in 2014, looking for assets to repay the $56,450 owed to his client, Lamar Advantage GP Company LLC, for unpaid billboard advertising. Eventually Brinn’s debt was paid through the sale of the JS Gold building Downtown. But he was never able to locate Saylor. “A lot of people got stuck holding the bag,” Brinn said. But Barrett, of Main Street Coin, said he always expected Saylor to re-emerge in the gold business someday. And resurface he did, four years later, on March 28. He joined Nextdoor Mariemont, a private social network people use to discuss neighborhood happenings and post items they want to buy, sell or just give away. A day after joining, Saylor made his first post on the network, just as the price of gold hit $1,252 an ounce – nearly $100 more an ounce than it was worth two months before. Jon Saylor began posting messages on a neighborhood network site on March 29, offering to buy gold and silver. Saylor promised to “outbid any competitor,” and offered to meet at any public place or local police department. “Whatever you feel most comfortable with,” his post said. “He … was very nice, professional and gave me a great price,” wrote Mary Ann Schwartz, who sold an unwanted gold bracelet to Saylor in a post endorsing him. As the price of gold rose higher this spring, Saylor posted more frequently, offering to buy old jewelry. As the price of gold crept upward this spring, Saylor’s posts continued. “This could be a long shot, but … I am looking for an office space that is ground level with windows...I only need 200-400 SF....:) If this rings any bells great, if not thank you for reading,” he posted on May 12. His posts usually coincided with a sharp spike or dip in the price of gold. “Good morning everybody, gold shot up to $1267 last night which is good news if you have any old jewelry laying around you no longer wear,” Saylor wrote in a post on May 30. Jon Saylor posted this message on a neighborhood social network site on May 12. “If you have any old gold or silver jewelry you no longer want or wear or you have coins you wanted to cash in, give me a call or text … I consistently pay higher than stores! Have a great day everyone:)” Saylor posted on July 6. Anyone who regularly buys and sells gold and silver is required to have a precious metals dealer license in Ohio. But Saylor does not have a license, said Kerry Francis, a spokesperson for the Ohio Department of Commerce. Occasionally buying gold on a social network site is not necessarily a violation of the law, Francis said. “But, if someone were to engage regularly in this conduct, we would need more information in order to reach a conclusion,” Francis said. A first time offender could be charged with a first-degree misdemeanor, and each subsequent offense would be a fifth-degree felony. In the past, JS Gold operated for more than two years without a precious metals license, prompting the state agency to fine it $5,000 on May 23, 2012. Barrett, of Main Street Coin, says he knows plenty of people who buy and sell gold at flea markets and other spots who do not have precious metals licenses. Saylor also appears to have branched out to a new business – selling light up and glowing toys and novelties at local music festivals and events. Jon Saylor's new company, Aiko Light Up Novelties, sells glowing toys and novelties. Saylor incorporated the new business, Aiko Light Up Novelties, in June 2016, using his father’s Loveland home as the business address, according to county auditor records. After hesitating for a few seconds, he then said, “Let me call you back." WCPO called him again and left two messages requesting an interview. His voice mail message states, "You've reached River City Gold & Coin, Cincinnati's premier buyer of precious metals and coins ... and remember if you're selling somewhere else, you're selling for less." "I have dedicated years of my life to becoming a numismatist. It is my life's passion, it is what I love. I am not looking to 'strike gold' rather I am only looking to continue in the profession that means so much to me. What happened to JS is one of the greatest tragedies of my life. It was never my intent to be in default with anyone. No one plans to be in debt but because of events beyond my control it is what happened. Any debts that I do have I plan to resolve when I am in a position to do so. I am literally just starting out. Saying that I am back in business is an overstatement. With regard to licensing, it is my understanding that, based on the nature of my business, I would be exempt just as all of the other coin dealers in Cincinnati are. If I am outside of any license requirements, this is something I would seek to rectify. What is not in dispute is how I have always dealt ethically with my customers. The success JS Gold & Coin once had can be attributed to this. I dealt with customers then just as I do now, ethically and fair." In the meantime, Saylor is still buying and selling gold through Nextdoor Mariemont. In his newest post on Aug. 1, Saylor wrote, "It is a great day to sell ... gold is now up to $1,270 which means your old gold jewelry may be work more than you think :)"
But Karoleff wonders whether Saylor’s customers are being paid as much as they should for their old jewelry and gold. WCPO Investigative Reporter Hillary Lake contributed to this story. Watch her story on Wednesday at 6 p.m. on WCPO 9 on Your Side.